Posted by misscraftyfingers in Crafts, Stuff. I need about 200 brown pompoms about 1″ to 1.25″. Can you tell me how long it takes to make each pom pom? Is it reasonable for me to think I can make this many? I want to make them for a comforter for my daughter. 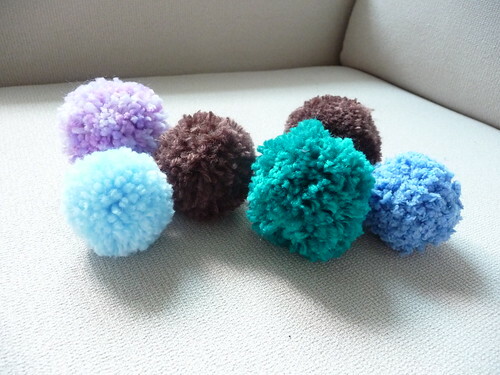 I saw a package of brown pom poms online, but they looked more like a ball of fuzz instead of a pom pom made of yarn. I like that blue one you show on the right (next to the greenish-aqua one). Is that chenille? Also, can you tell me what yarns you used for the two brown ones shown? Finally, how do you make them? They are really cute. Thank you. hmmm each pom pom probably takes less than 5 minutes to make. It may take longer if you take time to trim the yarn evenly. I used this method: http://belladia.typepad.com/bella_dia/2006/03/post_1.html … But there are other methods available too. Just google for the words how to make a yarn pom pom. If you have time & patience, of course you can make 200 pom poms. LOL. Although pom pom comforter…. hmmm .. wouldn’t it be hard to wash? Yarn pom poms are tied in the middle with a piece of yarn only, so I’m thinking the yarn pieces will fall out if you attempt to wash them.